This Revelation Timeline Decoded Bible study focuses on the Harlot Roman Catholic Church, who is a Mystery to John, as she acts like a Christian Church in order to deceive people and kill the saints. The seven bowls are judgments against the Antichrist Roman Catholic Church, so the context of this chapter is the Harlot Church. The Jesuits are the controlling power of the Roman scarlet beast that is using the Harlot Roman Catholic Church to draw the world under their control. The scarlet represents the blood they have shed during their Inquisition of killing the followers of Christ. They are called “Mystery, Babylon the Great,” because they pretend to be Christian, but they’re really the Babylonian religion of Sun and Satan worship. The Catechism of the Catholic Church proclaims that they are the ‘Mother’, the author of salvation, the teacher in the faith, and the head of all believers; which is an abomination. 169 Salvation comes from God alone; but because we receive the life of faith through the Church, she is our mother: “We believe the Church as the mother of our new birth, and not in the Church as if she were the author of our salvation.” Because she is our mother, she is also our teacher in the faith. 181 “Believing” is an ecclesial act. The Church’s faith precedes, engenders, supports and nourishes our faith. The Church is the mother of all believers. “No one can have God as Father who does not have the Church as Mother” (St. Cyprian, De unit. 6: PL 4, 519). And now in verse 5, John had been shown that the Babylonian pagan religion was still alive and would manifest itself in the form of the Harlot Church. Roman Catholicism is really the pagan Babylonian religion of Sun and Satan worship, mysteriously masked by the cover of Christianity. The idols of Babylon became the idols of Rome, which were then given Christian names. This is a well-known feature of the city of Rome. All the Latin poets for five hundred years speak of Rome as the seven-hilled city. Rome is depicted on her imperial coins as sitting on seven hills. The sixth head of the Wild Beast power ‘which carried the Harlot is stated to have been in existence at the time when the Apocalypse was written. Of the seven heads of the Wild Beast the angel says “five are fallen, and one is, and the other is not yet come.” These seven heads are interpreted to be ruling powers. Five of these were past, the sixth in existence, the seventh in the future. Hence the Wild Beast under its sixth head represented the Roman Empire as governed by the then existing Roman Emperors, and consequently the Harlot City borne by the Beast must have represented Rome itself. The ten horns represent the 10 civil kingdoms which formed after the Roman Empire collapsed, and the last Emperor was removed in 476 A.D. When the Little Horn of Daniel, the Popes of Rome, rose up among them, the civil kingdoms bowed down to the authority of the Popes. These kingdoms only existed for a short time and were succeeded by the permanent forms of government in Europe. The ten horns are interpreted as ten kingdoms, then future, into which the empire should be divided. These horns or kingdoms first submit to the Harlot City, and then rise against her, and” make her desolate and naked, and eat her -flesh, and burn her with fire.” Their futurity at that early date is indicated in the words, they “have received no kingdom as yet” (ver. 12). It is a notorious matter of history that the Western Roman Empire was thus divided into the Gothic kingdoms, whose average number has been ten for the last twelve or thirteen centuries; and that these Gothic kingdoms have overthrown the city of Rome, and laid it waste, after having been subject to it for centuries as the city of the Popes. Making war with the Lamb means they attacked His followers. They were the military power of the Popes of Rome, who were used to systematically persecute the saints, seeking to eliminate the witnesses against the Popes. Countries, such as France and Spain, obeyed the Popes and followed his orders to persecute the saints. Such was certainly the position of Rome. The nations of the world were then, and for centuries after, subject to her sway. The Popes of Rome rose to great power in the 12th century, when the commanded the kings of the earth, and all those in their domain. The Vatican has political relationships with almost every country in the world, and it has ecclesiastical power over 1.2 Billion people, who live in the nations of the world and speak different languages. Revelation 17:16-17, “And the ten horns which you saw on the beast, these will hate the harlot, make her desolate and naked, eat her flesh and burn her with fire. Horns of an animal, in the language of prophecy, represent the powers of which that empire or kingdom symbolized by the animal is composed. The Popes have historically ruled over the countries which occupy the area that was controlled by the Roman Empire. These will hate the harlot. This statement will be accomplished if these same powers represented by the ten horns, that were formerly in alliance with the Papacy, shall become its enemy, and contribute to its final overthrow. That is, it will be accomplished if the nations of Europe, embraced within the limits of those ten kingdoms, shall become hostile to the Papacy, and shall combine for its overthrow. And shall make her desolate and naked. Strip her of all her power and all her attractiveness. That is, applied to Papal Rome, all that is so gorgeous and alluring–her wealth, and pomp, and splendour– shall be taken away, and she will be seen as she is, without anything to dazzle the eye or to blind the mind. And shall eat her flesh. Shall completely destroy her–as if her flesh were consumed. Perhaps the image is taken from the practices of cannibals eating the flesh of their enemies slain in battle. If so, nothing could give a more impressive idea of the utter destruction of this formidable power, or of the feelings of those by whom its end would be brought about. and shall eat her flesh; not literally, but mystically; not out of love, but hatred; they shall take that to themselves, and make use of, which have fattened her, as bishoprics, and other benefices, lands, endowments belonging to abbeys, and monasteries, and other religious houses. And burn her with fire: alluding to the law in Leviticus 21:9 which required that the daughter of a priest, that played the whore, should be burnt with fire; and this is to be understood literally of burning the city of Rome, the seat of the whore, with fire; of which see Re 18:8. 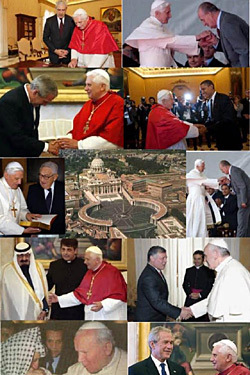 The Jesuits of Rome control the European countries, and once they are in full control of the world in their One World Government, they may command these countries to forsake their allegiance to the Roman Catholic Church. John is being told that it is the great city that reigns over the earth at his time, which is Rome. Today, Vatican City is a city-state, making it the smallest country in the world, that has political relations with almost every country. Presidents and world leaders who visit Vatican City bow to the Pope’s authority. The Jesuits controls the city state of Vatican City, which controls the world’s religious and political leaders. They control the City of London, which is the world’s financial power; and they control the city-state of Washington D.C., which is the world’s military power.